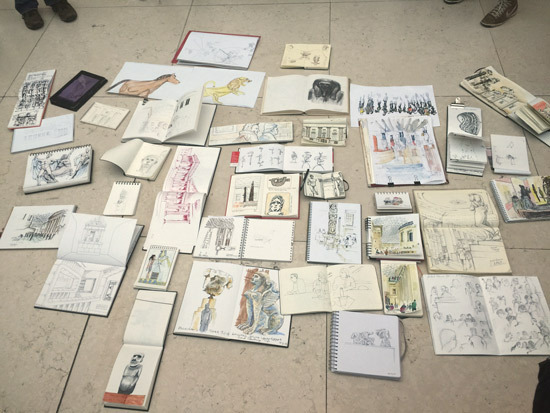 Below you can see a record of the "Let's Draw..." events in 2015 - plus photos of people who participated and sketches. In January, we got organised and drew up a schedule of places for every month in 2015 - starting in February. This helped enormously with making things happen. As a result - numbers attending the skethcrawls increased significantly over the year, both in terms of overall numbers and regular attenders. A large group came to the British Museum day which proved to be a very good place to go on a winter's day - although rather busy on a Saturday with lots of other people looking for things to see and do indoors! 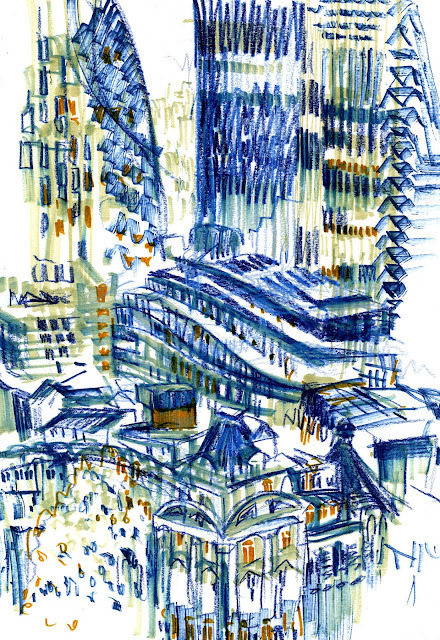 We had a brilliant sunny day for the next sketchcrawl - and there was as much sketching of South Ken cafe culture as there was of the museum and objects within it. 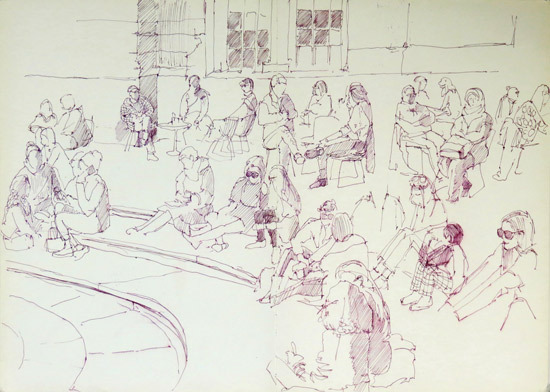 I spent a lot of time sketching people sat round the pool in the courtyard - soaking up the sun! 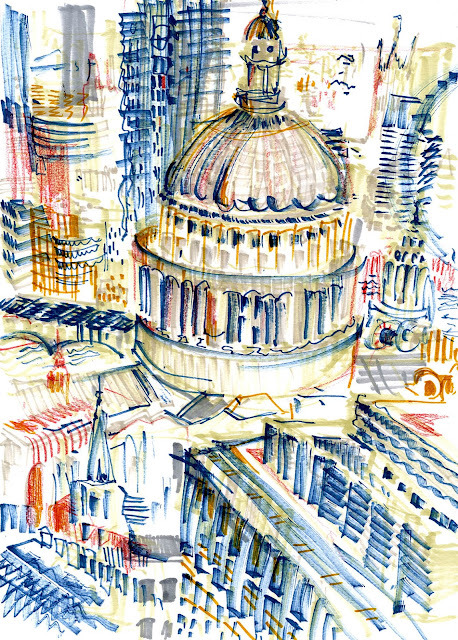 Sketching London from a height! gridded lines surrounding it. There was so much going on that I thought the only way I could capture this was through mark making, layering and pattern. The second drawing is the view of Finsbury Square, which you can get a brief glimpse of in the bottom corner with the Gherkin peeking through in the background. I tried to capture the density of the scene. It was great to see everyone’s impression of a challenging view. Thanks to James and Carlos for arranging such a great afternoon. 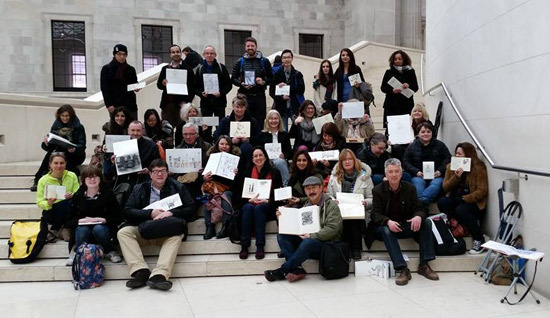 This December's "Let's Draw London" sketchcrawl on Saturday 12th December 2015, is based around Trafalgar Square and the National Gallery. PLEASE NOTE THE LATE START. This is the Event Link on Facebook. In early December the Christmas Tree from Norway is erected in Trafalgar Square. You can see a photo of it that I took on Friday afternoon last week above. For those wanting to sketch the Christmas Tree and the lights at the entrance to the Strand I recommend experimenting with some dark paper with you and media which works on top of dark paper! Otherwise you just end up filling in a lot of darks! In case it's wet or for those of us who don't do to well in cold/damp weather (I shall be indoors! 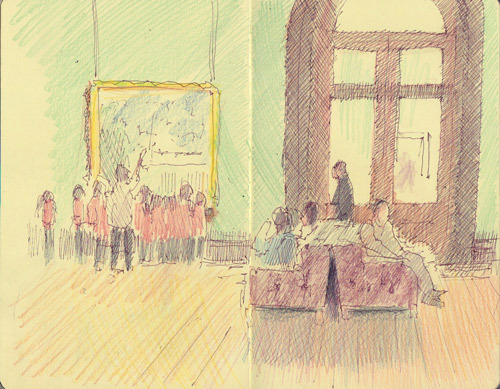 ), the National Gallery offers lots of opportunities for keeping warm and dry and drawing people and paintings in art galleries. The trick with drawing people fast is to focus on the shape, size and posture and not the faces. There's also any amount of architecture and perspective in the very large interiors to keep the 'drawing buildings' fans happy! PLEASE NOTE: The National Gallery does not allow wet media for sketching. You need to use pencils or coloured pencils. Pens that don't use wet ink seem to be OK i.e. no dip pens and no fountain pens. 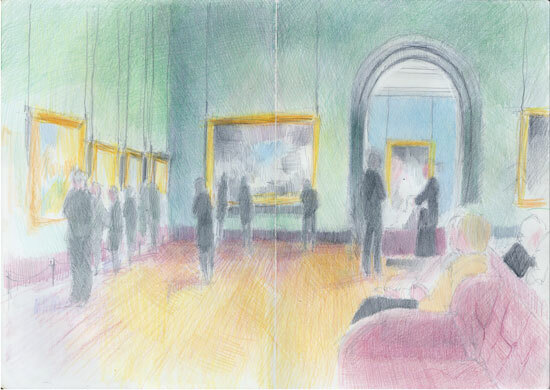 Looking at the Turners in the National Gallery - sketched from the splendid red sofas! AFTERWARDS: Buttery section of the National Dining Rooms - at the top of the stairs in the Sainsbury Wing for tea and cake! Nearest Tube Stations - Charing Cross, Leicester Square, Embankment - so far as I am aware there are no planned closures. 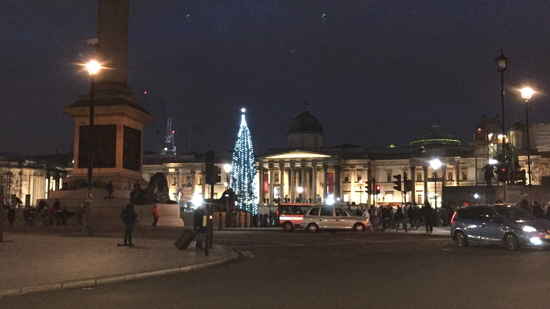 In early December the Christmas Tree from Norway is erected in Trafalgar Square. Last year it was lit on 4th December.Plus the National Gallery offers lots of opportunities for keeping warm and dry and drawing people in art galleries. I often walk past this spot outside Liverpool Street station and think to myself, "There's Tom Cruise's house..." Of course, it isn't really, but it was used as the location for the team's secret "safe house" in the 1996 film "Mission Impossible". 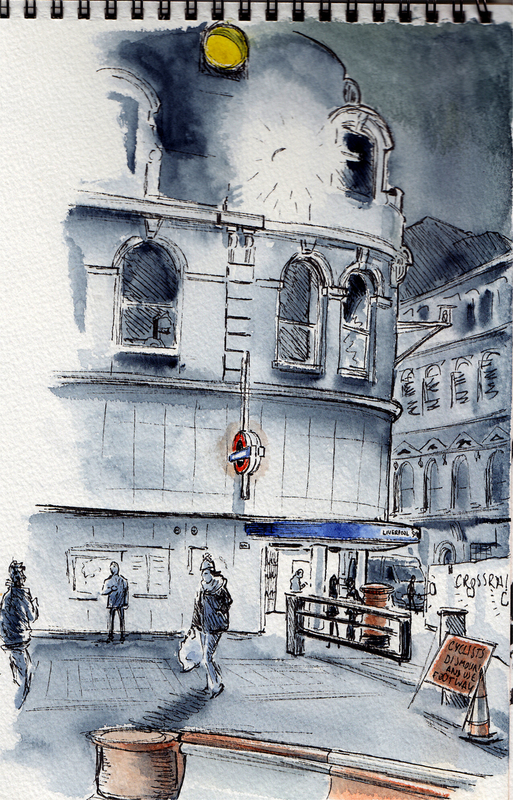 I find it a clever choice, because it's an unusual building but quite iconic, situated directly above a tube entrance, jutting out into two streets, and that classic Victorian railway architecture. So the other day I decided to stop and draw it. It must be 20 years since they filmed Tom here, but it hasn't changed at all. Below is a composite from the film, for comparison. 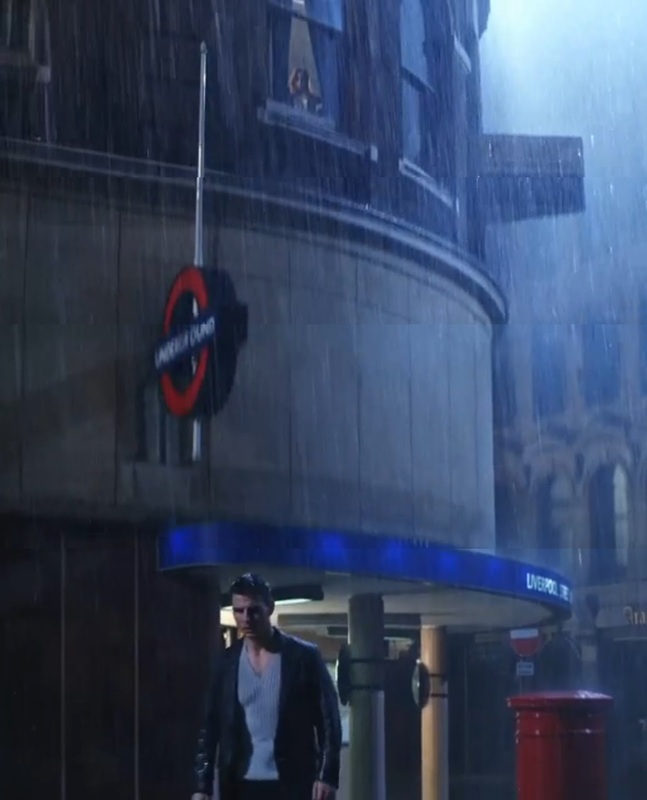 The latest Mission Impossible movie that came out this year saw Tom Cruise and co. in Kings Cross Station, so perhaps he's working his way around the Monopoly board.